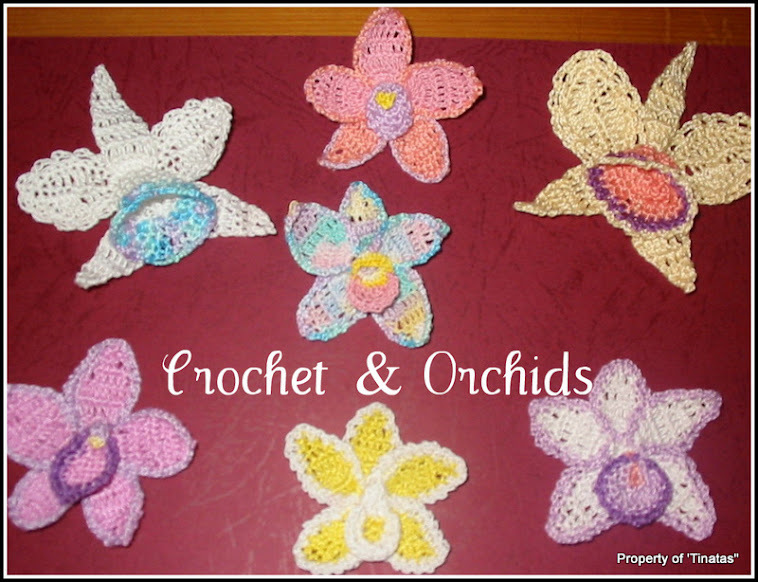 Crochet and Orchids: I'm Back! Hi to everyone of you patient people that follow my blog!! Sorry I haven't posted for so long but I have been feeling a 'little' sorry for myself but that is all over now. I still can't really crochet for any length of time but with excersize and practice, I am hoping my hand and wrist will be back in action again soon. Can't wait really because I have my missed my crafts so much. I did manage a few rows of bead knitting yesterday but it was very slow going. I need to finish my baby dolls before Christmas arrives and I am having trouble believing that it's only two months away from today. Hmmm.. Have to get a wriggle on... The past few months have been very busy in other ways, three orchid shows to attend, one of which I helped organise and which went off really well. Below are the trophy's John and I won with our orchids this year, and some of the flowers. Hope you enjoy viewing them. Bye for now, hope to have one of my dolls to show you really soon. Some of the orhid society members enjoying pizza night in the show room. congrats on the wins. Your orchids are awesome. Hi Tina .. Great to see you blogging again and I hope your hands and wrists get back to normal soon. Congratulations on such beautiful orchids and of course your wins at the show. Yes, Christmas isn't far away - bit scary really. I'm not planning on any crochet gifts (except for one exchange gift) this year but I do have to make space in my craft room for some overseas guests to sleep. That is a daunting thought and a huge job. Your Orchids are stunning, such beautiful colours :)) Congrats on your prizes.